As the parent of an autistic child, one of my worst nightmares unfolded– not once, but twice. And then nearly a third time when she was a teenager. 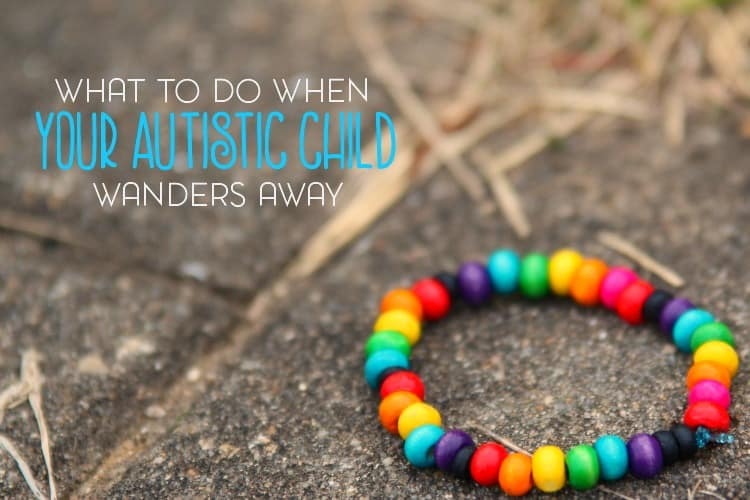 Here’s what to do when your autistic child wanders or elopes from home. Imagine this: waking up on a Saturday morning, just as you would on any morning. But this morning something feels different. You can’t quite pinpoint what it is- but you just know that something isn’t quite right. With the nagging feeling in your stomach, you go downstairs and instead of seeing your autistic daughter sitting on the couch waiting for you; you see the front door slightly ajar. Almost instantly, you’re in panic mode. Frantically you search from room to room downstairs and take note of the open cabinets in the kitchen, you check the backyard, and then you run upstairs. Out of desperation, you search in your child’s rarely used bedroom and when you see the still perfectly made bed; the realization hits you full force. Your autistic child has wandered away from home. Wandering, also called elopement, happens more often than you think with an autistic individual. Sometimes these individuals are verbal and sometimes they’re not. Sometimes they aren’t found, sometimes they return on their own, and sometimes the tragic happens. 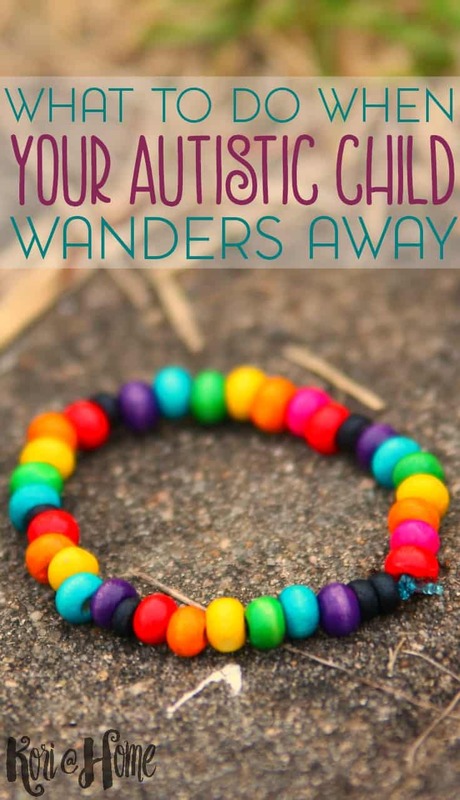 According to recent studies, nearly half of all individuals with autism will wander at least once in their lifetime. Do you have a wandering child? If yes, then you’ll know what I’ve been through with my own daughter. If not, then I’ll try to keep these memories brief. It’s not something that I always enjoy talking about but again, I feel the need to share and bring awareness. 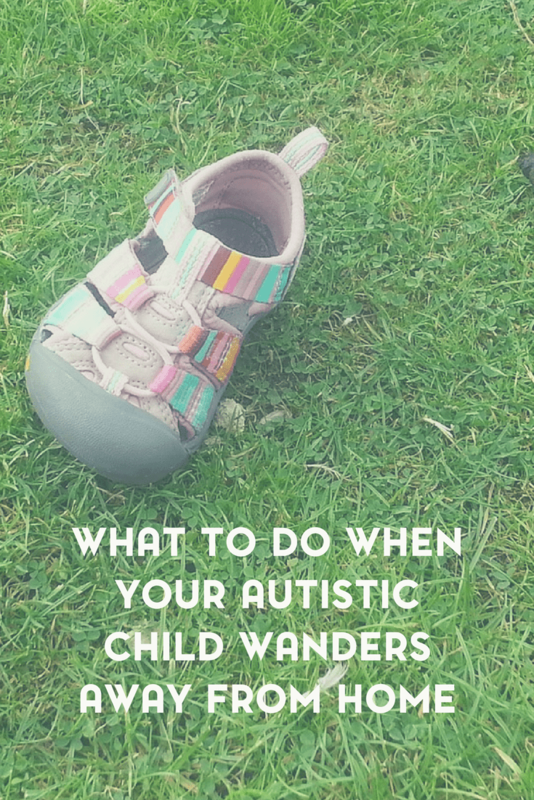 My autistic daughter has wandered from home twice. And each time was horrifying. Not a situation that I would wish on anyone. I woke up earlier than usual, I’m not sure why, maybe my instinct was just telling me that something was potentially going wrong. At the time, B was sharing the bed with me and her father, something that had started after she had gotten sick one evening. And soon enough it had just become a part of her routine. Most mornings, she would get up and go downstairs, waiting on the couch with her favorite Cookie Monster toy for everyone else to wake up and for someone to feed her. But that morning, there was something wrong. When I went downstairs to check on her, the first thing I noticed was the open front door. It wasn’t even wide open, just open enough. We did have a chain lock and key for the front door, as it needs to be locked from the inside as well as the outside. At the time, the chain lock was low enough for her to reach and I’m not sure if the key was in the door or not. B is observant, very observant, so she knew enough that the chain lock had to be undone to open the door. Most of the time, however, an adult was awake when she tried to play with the lock. And once I saw that open door, my heart sank. Immediately, I checked the kitchen and basement just to be on the safe side but to no avail. I wasn’t sure when she had gotten out, so I wasn’t sure how long she had been gone or where she could have possibly gone to. But once I realized she was missing, I ran back upstairs to alert her father. He went searching through the neighborhood and I called the police. Once I was on the phone, my fears subsided as I could clearly hear her in the background- I knew that stimming noise anywhere. I was able to describe her in great detail and we then went down to the police station to get her. We were informed that she was found near the McDonald’s by our house. A great feat indeed because that requires crossing quite a busy intersection. I have no idea what traffic was like at the time, but thank goodness she managed to navigate her way down there unscathed. We would often walk to McDonald’s, so she definitely knew the way to get there. Suffice it to say, after that incident, we stopped walking to McDonald’s. The second time she got out was similar to the first time, only it was 2013. At the time, her father and I were separated and I was staying with my boyfriend during the week. B, once again guided by her stomach, went to the local McDonald’s only to be found by a good Samaritan. I got a phone call in the wee hours of the morning from her father and then another from CPS (as they’re prone to getting involved in situations like that- a living nightmare, to say the least.). I had to work the next day and didn’t get much sleep that night, in addition to being four months pregnant. Both times, God must have been looking out for her. Because, by the grace of God, someone found her and took her to the hotel across the street, to a safe place. I can’t even imagine what could have happened to my poor girl. She’s non-verbal and innocent. She trusts adults too easily, she has no sense of danger, and no real fear of strangers. Now, we have an alarm system for the house that goes off whenever any of the access doors (front, back, basement) are opened. We also have a new slide lock that’s higher up on the door frame and all keys are kept out of sight. B has a sound alarm, that makes a noise similar to a doorbell, on her bedroom door. I’m working on getting an ankle ID bracelet and possibly something else for her. I’m open to anything. We’re also looking into AngelSense. She’s gotten better at public situations, but there were also times that she would bolt. I remember a few times at the mall that she would run. Or, during our family vacation to Sesame Place, the first day we had stopped at a local mall and B made a run for it. I was chasing her through the mall, and she was laughing. Because of this, she holds someone’s hand at all times or she holds someone’s arm at all times. Because, no matter her age, she’s my wandering child and I will do anything to keep her safe. 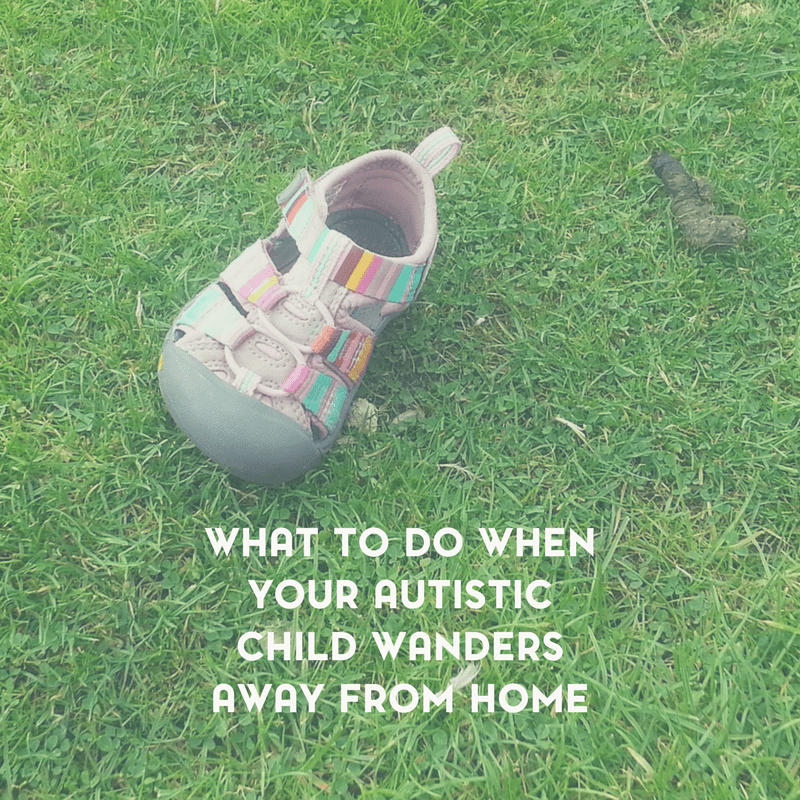 So would you know what to do if your autistic child wandered from home or another safe place? What if your child, like mine, is non-verbal? How would you prepare for this situation? I touched on this topic briefly in my Autism A to Z series. In that post, I shared a few links for resources and you can view that post: What to Do When They Wander if you’d like. I’m also including a set of simple ID cards that you can print out and laminate. There’s space on there to write your child’s name, your name & cell phone name, father’s name & cell phone number, and home address & home phone number. Before they go to bed or before you send them to school, make note of what they’re wearing: t-shirt (color, long sleeves or short sleeves), pants, shoes, socks, etc. If you need to, write this down and keep it at your bedside or near your cell phone or home phone. This will help you so much when you’re speaking to law enforcement and panic mode has taken over. This is a living nightmare that I would never wish upon anyone. I’m fortunate that my daughter was found safely and that she is still with me. But if this should happen to you, at least you’ll hopefully know what to do when your autistic child wanders. This post was originally published on August 9, 2014 and was updated on March 3, 2016 to include the ID cards, the printable checklist, and an improved image. Oh Kori, my heart goes out to you! Nothing is worse than the fear for our children, and the wandering could be so dangerous! You are sure one special mother! You and your family are in my prayers! Hugs! Wow, that would be tough to deal with, but it sounds as if you are handling it well. So many fears we have for our children. My heart goes out to you. Keep up the good work and know that you are a beautiful person to be there for your child. It’s easy to see the love here. So sorry I am just getting around to visiting your blog. My heart goes out to you, we all want our children safe. Bless you! Having a wondering child could be so scary. One cousin is autistic and wanders. One time she was found in a corn field, and another she had locked herself into the trunk of their car. 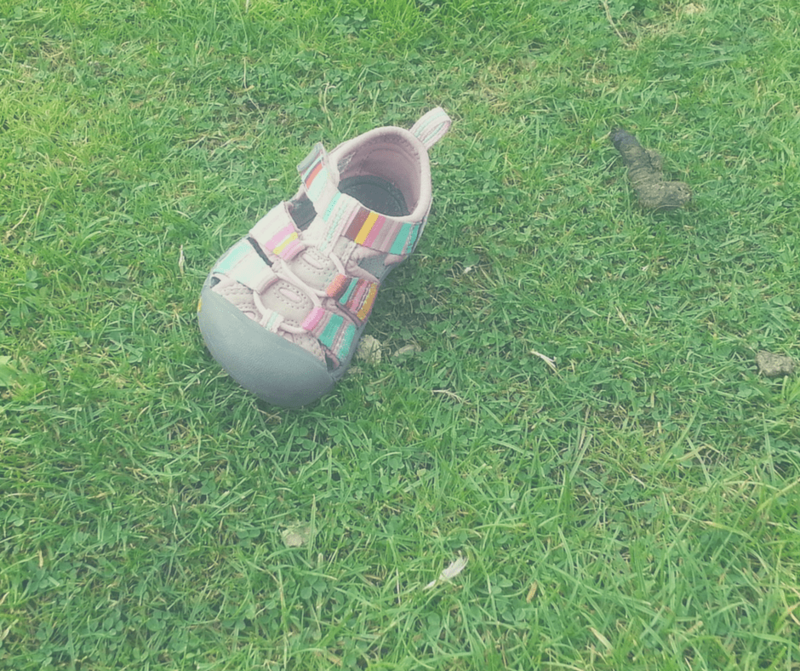 I can’t imagine the fear a parent goes through when their child wanders. My daughter was just diagnosed this week as Autistic, I never considered this part of it. Your doing great- I am going to read through some of your other posts. I needed this. Oh wow my thoughts are with you. It must be really hard as our only thought is to protect our children. When I got to the part about you finding the pen door, my heard dropped. I know that feeling, and it is not a good one. I think we all worry about and fear for our kids on some level. I am so sorry you have to deal with this, but it sounds like you’re handling it. I’m really glad she was found safe those two times she wandered. She is so lucky to have a mom like you, looking out for her! I’m so glad your daughter was found safe. My oldest great-grandson is an active 12 year old autistic boy. We are lucky and blessed as he is the oldest of 4 brothers. He is doing well in special classes. and is like most boys his age, Thank you for your wonderful post on the Wandering Child. I have learned quite a few things about autism thank to you. How scary for you. I am.glad each time she was found safe but sheesh! Yeah, it’s definitely not something I want to repeat. Ever again. This one really hit home for me. My daughter is HFA and is a wanderer… or as we call her- “our little flight risk!” She is only 5, so it can be really scary! B was nicknamed the Escape Artist for a little while. Wow, so young.. she was around that age the first time and I was terrified. The first couple of nights after, I hardly got any sleep. Thank you for sharing your story. I know that had to be so scary! Sorry to hear about this. I can only imagine the panic! Hugs to you! My daughter’s sister in law wanders off too, it happened the other day right before we arrived and everyone was still shook up. I don’t think people realize that this happens as much as it does. It’s one of those side things that usually doesn’t draw much attention, unless you’re looking for the story I think. And usually when it’s in the news, it’s because of tragic reasons. How absolutely terrifying those experiences must have been for you, one of every mother’s worst nightmares. Thank you for talking about it. I didn’t know about “wandering”. Most often, when it shows up in the news, it’s because of tragic reasons. Still, I hope bringing some awareness to it helps. There no peace of mind if a child just gonna be gone as soon as he/she finds an opportunity. Glad that everything’s well.